The 2019 Catalogue is Here! 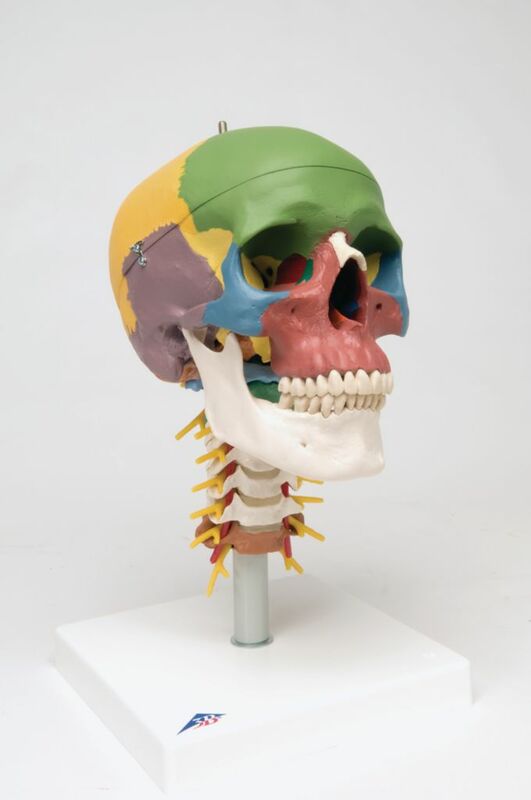 This human skull model uses 19 didactic colors to show the shapes and relationships of the various bone plates of the skull. 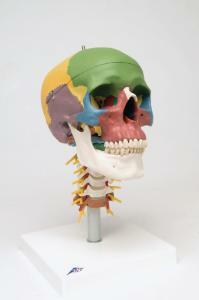 This human skull replica is flexibly mounted on the cervical spine (C1, C2 and C7 are colored). 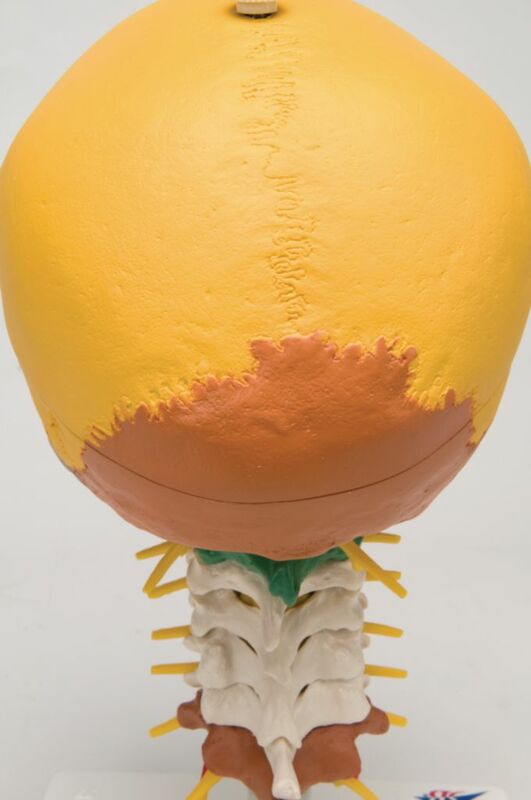 The didactic model also exhibits the hindbrain, spinal cord, spinal nerves of the cervical spine, vertebral arteries, basilar artery and rear cerebral arteries. The plastic skull can be removed from its stand. We found alternative products that can save you up to per item-unit. To compare product details, select up to 3 alternatives below and click Compare Selected. To add items to your basket, enter a quantity and click Add to Basket. We multiply the savings per unit (in parenthesis) times the total units of the original product. Boreal Science in Your Inbox! Latest products, exclusive offers, and more. Copyright © 2019 Boreal Science. All rights reserved. We’ve made it easy to place your Boreal Science order by providing all the information you need below. All orders are governed by the Terms and Conditions of Product Sale accessible here. By placing an order, you represent that you have read and agree to the Terms and Conditions of Product Sale. All orders will incur shipping and handling fees added to the total order value. Shipping charges may vary based on the nature of the product, total weight, destination, delivery date, and delivery method. Orders will ship via UPS carrier at current published rates. Shipping costs are estimated at time of online order. Orders required to ship by motor freight may incur an additional shipping charge. All orders $24.99 or less (pre-tax) will be subject to an additional $7.00 handling fee. Our shipping terms are FOB shipping point unless otherwise specified. For more information about specific shipping terms for your account, contact your Boreal Science Account Manager. Visit boreal.com/repfinder to locate a representative in your area. Receive FREE standard ground shipping on orders of $250 or more when you place your order online at boreal.com with promo code FREESHIP250. Order total must be at least $250 before tax; total may include live and hazardous materials, however these materials will remain subject to standard shipping charges and fees. Excludes all standard carrier extended freight areas and the Yukon, Northwest Territories, and Nunavut. Materials classified as hazardous by Transport Canada. may include, but are not limited to, chemicals, microbiological specimens, or activity kits containing these materials. If your order contains an item classified as hazardous by Transport Canada, a minimum $17.50 fee will be charged for each shipment. Orders for chemicals and hazardous materials will only be accepted from educational and research institutions; we will not ship chemicals to individuals. Hazardous shipments must be shipped by ground transportation. Select chemicals are now available with Poison Packs to eliminate hazardous shipping fees and enable faster shipping. Previously, these chemicals shipped freight within 7-14 days and incurred a hazardous shipping fee added to your order total. Now, added Poison Packs eliminate hazardous shipping fees and enable your chemicals to ship via UPS to arrive within 5-7 business days. For a list of chemicals that include Poison Packs, visit boreal.com/chemicalship. All micro life cultures will be delivered to you within two business days when order is placed before 12:00 pm EST. Your specimens or cultures will arrive in good condition or we will send a free replacement. Requesting a delivery date of Wednesday, Thursday, or Friday ensures healthy delivery of your live specimens. Live materials will not be delivered on Mondays. For Tuesday deliveries, additional shipping charges may apply. Contact Boreal Science customer service (800-387-9393) to arrange a Tuesday live materials delivery. For live materials coupon redemption, visit boreal.com/livematerials. In instances of severe weather, we may delay or cancel a shipment if it will not arrive safely. See our home page for the latest updates if you suspect weather could be an issue in your area. If your school is closed due to weather, please call customer service to let us know and we will hold your specimen and reschedule at your convenience. Shipping pathogens and bacterial cultures to high schools and individuals is prohibited by the Federal Health Service. Province or local authorities may require a permit before we can ship pathogens to you. Colleges and universities are permitted to order pathogens and bacterial cultures through an institutional purchase order only. Every effort is made to ensure accuracy in our product images, descriptions, and pricing prior to publication. However, due to occasional changes made by vendors after the date of publication, the physical appearance of items may change or vary in colour from what is shown in the catalogue. We assure the items you receive will satisfy all product specifications and requirements. Catalogue pricing and product availability is subject to change. If a typographical error in pricing should occur, we are not obligated to honor the misprinted price. Please check our website for the most recent updates to product images, descriptions, availability, and pricing. Thousands of our best-selling products are always stocked and ready when you need them, so you don’t have to wait for the items you use most. Items are shipped within 48 hours of ordering when order is received electronically or by phone prior to 1:00pm EST. In-stock promise and 48-hour shipping time excludes hazardous chemicals and exceptional order quantities which will be made available at lead time. Availability subject to change in the event of natural disaster or forces of nature affecting sourcing, shipping, transportation, or availability of living materials required for producing saleable goods. Boreal Science will contact the customer directly to communicate the occurrence of such an event and provide alternative materials when available. Current stock and availability for all products is available online on every product page. Unless otherwise specified, any item with a price ending in ‘9’ (i.e. $5.09, $14.99, $100.89) is excluded from special offers, discounts, and promotions. Promotional discounts may not be combined with any other offers, discounts or promotions. Offers for free shipping include standard ground shipping only. Credit is extended to all educational institutions. Terms are net 30 days from the date of invoice. Teachers’ personal orders are always welcome. For more information email borealcs@vwr.com. Sales tax will be included on your invoice. If you are exempt from sales tax, please provide proper documentation when placing your order. item for refund, replacement, or credit, please email borealcs@vwr.com or call 800-387-9393 for a return authorization number and further instructions for return. Please have your order number readily available so that we can better assist you. In some cases, a restocking fee may apply. Items returned without prior authorization may not be accepted or credited. Items under warranty will be repaired or replaced at our discretion. To ensure the quickest return or replacement, we recommend you inspect all packages immediately upon arrival to ensure your satisfaction. A carrier inspection may be required.